Finding the newsworthy and notable took a lot of sifting through the glitz and sizzle of the show floor. Barcelona, which just might be my favorite city in the Europe, one again served as host to one of the largest mobile-focused conferences in the world, Mobile World Congress. With more than 100,000 attendees and thousands of companies present, the late February-early March event provided easy access to the heart of the mobile industry for a glimpse of where we are and where we are going. When I last attended three years ago, I returned very excited about developments in the mobile space. This year, I have mixed feelings. While I did discover several things of interest and importance, I had a hard time finding them behind the glitz, sizzle and, in some cases, amusement park feel of the show floor. What surprised me most this year was how much the event reminded me of Epcot (which, for the record, I love). 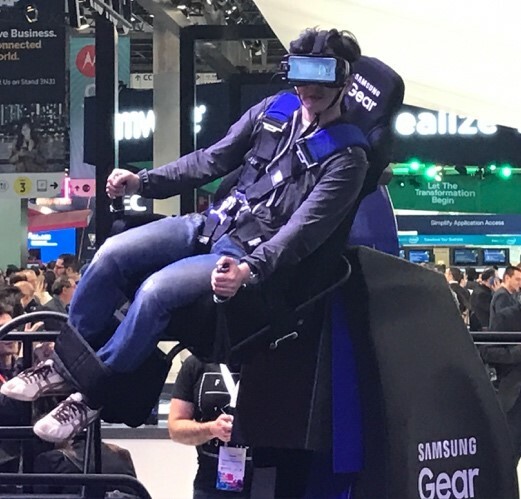 Most notably similar were the "rides" Samsung offered to showcase its virtual reality hardware. In one ride people laid on tables and were subjected to all manner of movements timed with VR scenes that looked quite ridiculous. Others had individuals and entire groups shaking and moving through space. All of this was meant to entertain attendees and demonstrate how much fun VR can be, with the main goal -- of course -- being to get people to associate Samsung with entertainment rather than exploding batteries. And by the lines of people waiting to strap in to these crazy contraptions, the strategy may have worked. It used to be that Samsung would use the MWC spotlight for major announcements. But recently it has taken the Apple approach of having its own standalone launch events that don't compete in the crowded media space of MWC. While that works for Samsung, it takes away from MWC, which suffered from a lack of interesting announcements of major consequence to the industry. 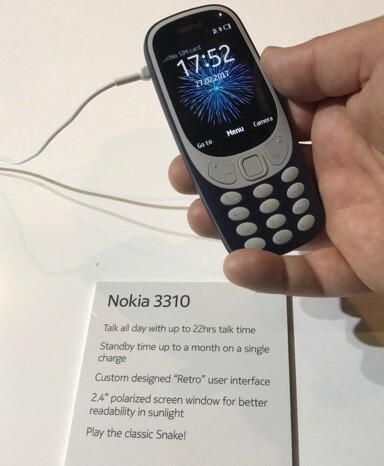 Hard wise, in fact, the most hyped announcement was for the Nokia 3310, a remake of the 17-year-old classic phone that even featured a version of the Snake game that ran on the original. Snake fans rejoiced, and crowded the Nokia booth to catch a glimpse. There is an obvious vacuum of announcements when an ancient relic reboot makes headlines. I will say that as disappointed I was in the advancements from the top-tier phone manufacturers, I was impressed with improvements from the lower end of the market. My personal "Tom Brannen Best in Show Award" goes not to LG, HTC, Sony, or Samsung... but to ZTE. The Axon 7 Max had a gorgeous 3D screen and the best dual-camera system I have ever seen. Not only can you take and display 3D photographs with this smartphone, but also change the focus of pictures after you have taken them... all of this from a "budget" manufacturer. I found the future-looks all pretty underwhelming, except for the technology and conversation around self-driving cars. This is going to be a huge area of opportunity, and one of the bigger drivers (pun intended) of 5G. Not only will the "car of tomorrow" require tons of bandwidth, it will need to be everywhere. 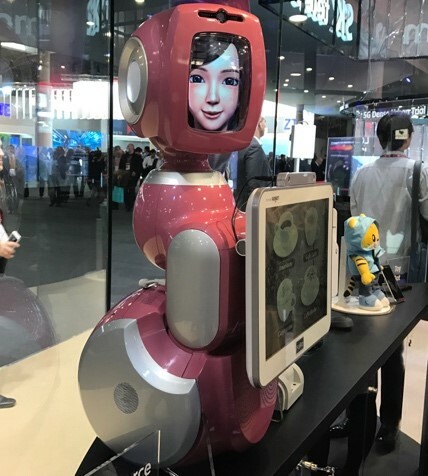 But as pointed out during a GSMA session on 5G, a car needs to be able to operate without a network connection for it to be truly autonomous. So we need to build out the 5G network to support autonomous vehicles while simultaneously building autonomous vehicles that can operate without 5G. Of course, mention of 5G was everywhere -- not surprising since it will, after all, be at the center of the Epcot-like future of tomorrow. Beyond the hype, I did manage to find a few items of great interest. First, while 5G is coming, industry watchers debate on how quickly it will come and how pervasive it will be in the next five years. The differing viewpoints from the U.S., China vs. Europe, and the rest of the world were noticeable in a panel discussion I attended on 5G. The cost and complexity of building out 5G will be significant, and will lead us to a situation of haves and have-nots. The wealthy nations of the world will be able to deploy 5G quickly, while others will be left behind. This of course isn't a new phenomenon, but the gap will widen significantly. The other interesting concept discussed during the panel is how the models of delivery will be changing to allow for new revenue opportunities. While the mobile space has been dominated by the consumer market for more than a decade, the increased capabilities and costs will necessitate a shift to B2B and B2B2C. The latter will be interesting to follow as non-traditional technology companies, such as automakers, get into the business of both consuming and selling data services. As all-encompassing as the show is, it is always strange to see such a huge segment of the international mobile industry minus Google and Apple. I wonder if we will see participation from either of these players at GSMA Mobile World Congress Americas 2017, which will take place this September in San Francisco, their backyard. Perhaps they don't attend MWC in Barcelona because their traveling staff would all have to go out and buy suits and formal business attire. (Just kidding.) More likely, they feel they don't have to fly half way around the world to show the world what they can do when the world comes to them on demand. Either way, I imagine San Francisco will be much more casual than the European/Asian formality that dominates the Barcelona event... which will make it look even more like Epcot. While 5G is not yet delivering a life-altering experience, there are some key developments that will have a more immediate impact on enterprise customers. Fuze, Metaswitch, and Verizon seek new ways to improve the mobile business user’s communications and collaboration experience. The NFL scored big with the data it gathered from its Super Bowl Wi-Fi network, and with the right approach, you can too. Is 5G a Better Choice for Indoor Mobile Data? Wi-Fi is your most likely answer for data mobility indoors, but the carriers are pursuing 5G as an option.